Performance was the first thing they addressed today: Windows 8 actually has better performance than Windows 7, even with this metro interface running on top of a desktop. Tablet users and netbook users should notice a fairly significant performance increase with Windows 8. What it really "feels" like in real-world usage remains to be seen, but you can see a comparison between a task manager running on both operating systems above—which makes us pretty hopeful. Furthermore, any of your tablet-based apps will suspend themselves when you jump into the traditional desktop, so they don't take up any of your resources. 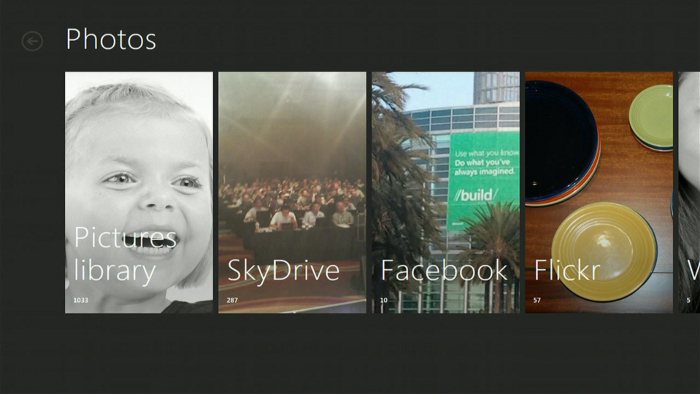 The home screen is very familiar to anyone who's used Windows Phone 7. You've got a set of tiles, each of which represents an application, and many of which show information and notifications that correspond to the app. For example, your email tile will tell you how many unread emails you have (and who they're from), your calendar tile will show upcoming events, your music tile will show you what's playing, and so on. You can also create tiles for games, contacts, and even traditional Windows apps that will pull you into the Windows desktop. The tablet-optimized apps are all full screen and "immersive", though, and you can rearrange their icons on the home screen easily (just as you would on any other tablet platform). Running a basic app works as you expect—you tap on its home screen icon and it goes full screen. The browser has lots of touch-based controls, like pinch to zoom and copy and paste, and apps can also share information one another easily. To do so, you just need to select text in the browser or choose a photo in their cloud-based photo app and hit the "Share" button—you'll then be able to pick an app to which you want to send that text or picture, and work with it from there. For example, you can share photos to Facebook, send text from a web page in an email, and so on. The Windows App Store looks much like the home screen, with tiles that correspond to different categories and featured apps. From there, you can look at a more detailed list of the available apps in a given section. And, the store contains not only touch-based apps for the tablet interface, but some of the more traditional desktop Windows apps you're used to, so you have one portal to discover all your Windows apps no matter what interface you're using. Windows Live is taking center stage as the backend for all of Windows 8's cloud syncing abilities. Your address book, photos, SkyDrive data, and even data within third-party apps can sync up to the cloud with Windows Live. The address book also syncs with other services like Facebook and Twitter as well. You can even sync all of your settings from one Windows 8 PC to another. Just sign onto your Windows 8 with a Windows Live ID and you'll get all your themes, languages, app settings, taskbar, and other preferences will show right up. It's a pretty neat feature if you have multiple Windows 8 PCs and don't want to set them all up separately—just a few taps and you've got all your preferences ready to go. 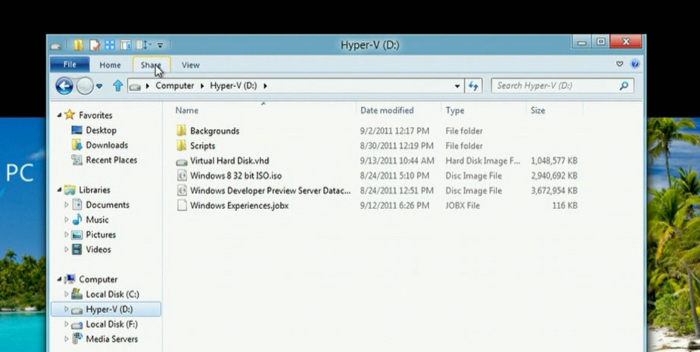 This is still just a small preview of Windows 8; we know there's a lot more coming, but this is what they showed us today. Got a feature you think is really neat? Share your thoughts about the upcoming OS in the comments. You can contact Whitson Gordon, the author of this post, at whitson@lifehacker.com.